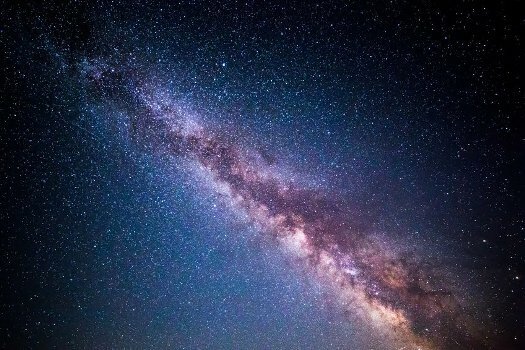 “Our hypothesis was that there’s some subset of stars that, for some reason, will match the movements of the dark matter,” said Jonah Herzog-Arbeitman, an undergraduate and a co-author on the paper. His work with Lisanti and her colleagues the summer after his first year at Princeton turned into one of his junior papers and contributed to this journal article. Their big breakthrough came when they compared the velocity of dark matter to that of stars with different “metallicities,” or ratios of heavy metals to lighter elements. The curve representing dark matter matched up beautifully with the stars that have the least heavy metals: “We saw everything line up,” Lisanti said. “It was one of those great examples of a pretty reasonable idea working pretty darn well,” Herzog-Arbeitman said. Astronomers have known for decades that metallicity can serve as a proxy for a star’s age, since metals and other heavy elements are formed in supernovas and the mergers of neutron stars. The small galaxies that merged with the Milky Way typically have comparatively less of these heavy elements. In retrospect, the correlation between dark matter and the oldest stars shouldn’t be surprising, said Necib. “The dark matter and these old stars have the same initial conditions: they started in the same place and they have the same properties … so at the end of the day, it makes sense that they’re both acted on only through gravity,” she said. Since 2009, researchers have been trying to observe dark matter directly, by putting very dense material — often xenon — deep underground and waiting for the dark matter that flows through the planet to interact with it. That’s why constraining the speed of dark matter is so important, she explained. If dark matter particles are both slow and light, they might not have enough kinetic energy to move the nuclear “billiard balls” at all, even if they smack right into one. “But if the dark matter comes in moving faster, it’s going to have more kinetic energy. That can increase the chance that in that collision, the recoil of the nucleus is going to be greater, so you’d be able to see it,” Lisanti said. So instead of using the interactions to determine the speed, researchers like Lisanti and her colleagues are hoping to flip the script, and use the speed to explain why the direct detection experiments haven’t detected anything yet. Having a completely independent way to work out the speed of dark matter could help shed light on that, she said. But so far, it’s only theoretical. Real-world astronomy hasn’t caught up to the wealth of data produced by the Eris simulation, so Lisanti and her colleagues don’t yet know how fast our galaxy’s oldest stars are moving. Fortunately, that information is being assembled right now by the European Space Agency’s Gaia telescope, which has been scanning the Milky Way since July 2014. So far, information on only a small subset of stars has been released, but the full dataset will include far more data on nearly a billion stars. “The wealth of data on the horizon from current and upcoming stellar surveys will provide a unique opportunity to understand this fundamental property of dark matter,” Lisanti said.